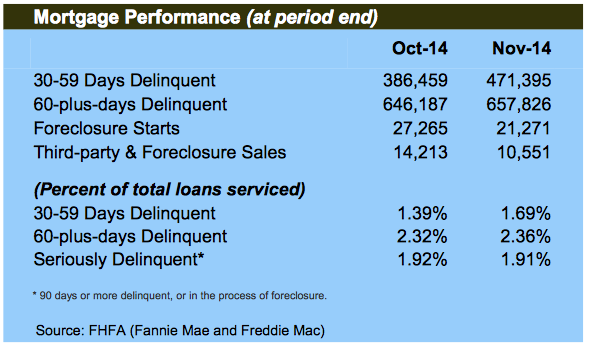 The seriously delinquent mortgage rate (90+ days late) fell to 1.91 percent of all outstanding mortgages in November, the lowest level since December 2008, according to a report just released by the Federal Housing Finance Agency (FHFA). The percentage of loans that were 30-59 days late rose in November to 1.69% from 1.39% the month before and the 60+ day delinquency rate rose from 2.32% in October to 2.36% in November. The tables below have complete mortgage delinquency data.